Safety issues concerning the need for handicap walking equipment are many. Yearly, one out of three people over the age of 65 will fall, and many of those falls results in injuries. For those under the age of 65, medical or physical conditions may place individuals at high risk for falls as well. Reasons people have for not purchasing or obtaining handicap walking devices are many, ranging from a fear of losing their independence, to the expectation of getting better very soon. Some people simply do not want to be seen using mobility equipment, as it does not fit in with their self-image. Stability, not just support, is essential, in ordering the correct handicap walking equipment. Consider the surface where the assistive walking equipment will be used. In addition, handicap walking equipment must be measured to meet the users’ dimensions. If the device is too short, the user will walk bending over, and if it is too tall, the user can fall over backwards. Get cushioning or soft grips on the handles that will meet the most amount of use. This will reduce the amount of pressure and allow you to use the device for longer periods. A medical supply company or physical therapist can measure the individual to custom-fit all walking devices. They can also assist the customer with insurance questions, to determine whether or not insurance will cover the cost. For a medical device evaluation, the patient can request an order from the doctor, get a home health agency to come to their home, or a patient can ask for a referral to an outpatient physical therapy clinic that can help them. For shoulder, neck, chest and upper arm problems, such as seen in car accidents, severe arthritis or fractures, using a standard crutches may be painful. 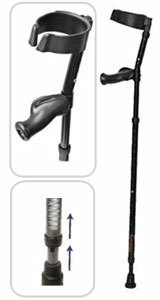 Forearm crutches are often used in these instances and in cases where using a normal cane or crutch is not an option. Sometimes, due to weak grip, extra support and control is indicated, and forearm crutches are excellent for this purpose. 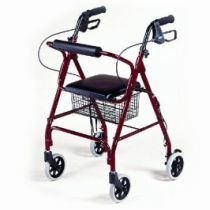 This is an example of specialized handicap walking equipment which is custom-fit. Once a person becomes accustomed to their walking aid, they shouldn’t be without it.